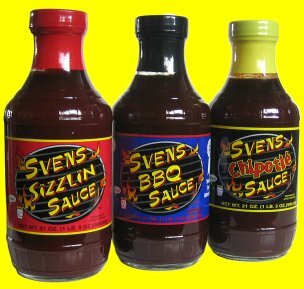 Jim Erickson (Sven) started making the sauce in 1995. Taking a recipe he already had and changed it to his liking. The end result was so good that family, friends, and friends of friends kept asking for more. The whole family started pitching in to help him make and distribute to fans of the sauce. We finally decided that it was becoming to much to handle making it at home and looked into having it made and distributed to the general public. Needless to say it wasn’t an easy task. Eventually we got it into the market in 1996 and have been working hard to spread it around. In October of 1997 Jon and Jim (Sven) Erickson (we) went down to the world famous American Royal International BBQ Contest in Kansas City, Missouri to find out just how well we could do with our sauce. It wasn’t until 4 weeks later that we received a ribbon in the mail for 4th place out of 281 contestants in the Mild Tomato division with a total of 412 entries that year. We use name brand products in our sauce to give you the best BBQ sauce we can. It caramelizes onto the meat while on the grille and gives you a great flavor. It’s the stick to your ribs BBQ sauce.